Bram was born during the star sign of Pisces and he truly is a little water baby! Since he loves his bath so much, it’s quickly become part of the evening ritual of putting him to bed. We usually bathe him in his Tummy Tub and he just sits there, smiling at us. Too cute! Mustela is a French baby skincare line that has been around for over 60 years. It has a gentle, powdery scent (that to me is so French!) and I have brought back this sample size of a cleansing gel from a ShopUp event last year. When I bathe Bram, I use only a tiny drop of this gel to wash his hear and his bum. It’s very gentle and lovely to use, and the fact that I’m still using that sample size even though Bram is nearly 4 months old, is telling something about how little of the product one needs for a good wash. I have used this for all of my babies. It creates a kind of milky cream bath which leaves your baby’s skin all soft and mushy. Very lovely! If it’s hot and sticky or Bram has done some big poos and I feel that he needs a foam bath, I like using the Eco by Naty bath bubbles. 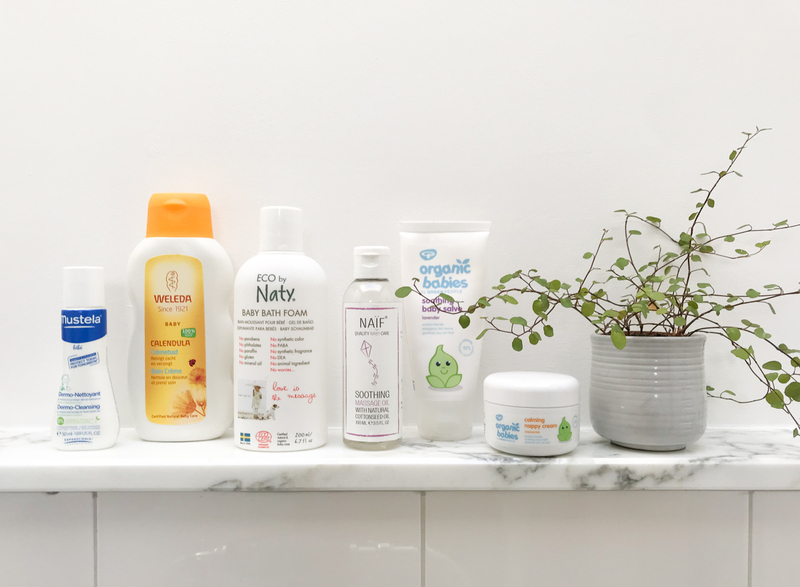 As I’ve written before, Naty prides itself of being one of the world’s most progressive companies in the field of ecology and their bath foam certainly has no nasties. Naïf’s massage oil is dry and silky and has the most lovely, gently scent. Massaging a baby after the bath is such a sweet one-on-one moment! Bram has suffered from skin outbreaks on his face every now and then, and I’ve discovered that this salve from Organic Baby is the miracle treatment. After washing him I apply some of this salve on his face (including his ears as they tend to be dry). It’s really amazing to see how well conditioned his skin gets from it. Works great on any dry or problematic skin I find (and it’s equally great for all of the other family members!). Bram hasn’t had a nappy rash yet (I’m using Naty nappies for him which are more breathable than conventional nappies, and I feel that really makes a difference). But sometimes his skin is a little red and then I like using Organic Baby’s calming nappy cream. It has an amazing, silky texture, it is such a lovely product to use. And you only need a tiny little drop to go a long way! I’m sad to see all these recommendations to be products that come in plastic packaging. Plastic pollution is such a devastating issue for our oceans. We ought to support the companies and brands who not only offer organic, chemical free products , but have those in plastic-free packaging. There are of those available.